I did it! I actually went to the grocery store and managed to not buy a single frozen item! We have just kicked off our own personal "find the bottom of the deep freezer challenge" and I am attempting to not buy anything frozen until the end of March when our Zaycon order arrives. Since I am refocusing our weekly budget to stock up on paper products, household items, and pantry staples this week's trip may look a little sparse when it comes to meat and other things we have on hand in the freezer. While this trip may not look like much, I was able to get 36 double rolls of toilet paper, 120 Finish Gel packs, and almost 75 trash bags and everything else for $40. I also used two $5./$30 Winn Dixie Coupons. I did spend $39 earlier this week on a good sized trip with lots of basics so that puts me around $80 for the whole week. 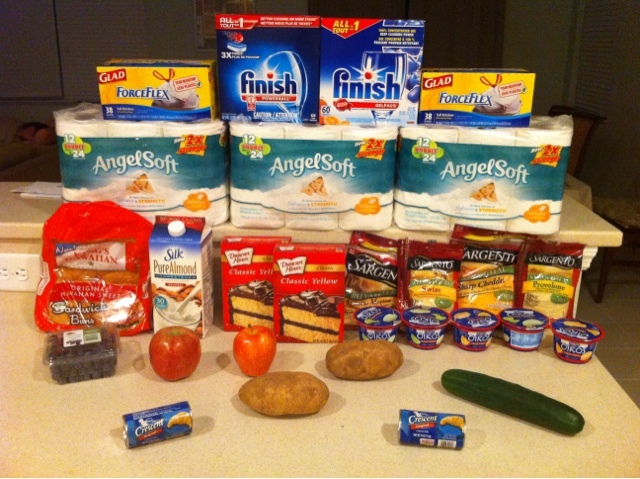 It's right at the top of my weekly cash budget but since I only spent $9 the week before, I had plenty of grocery cash on hand. It's going to be difficult to pass up those awesome frozen food deals, though. wow good job also good catch on the free King Hawaiian Sandwich Rolls, retails for $2.99, i totally missed that.. thanks for sharing..